Analysis: Nawaz Sharif is dishonest today. Can he never repent? Nawaz Sharif stepped down as prime minister last year after the top court ousted him over dishonesty. The court said he did not declare a particular source of income. Under Article 62, some disqualifications span five years. Friday’s ruling clarified, however, that Mr Sharif will never again be able to hold public office. The ousted PM may have been dishonest on the day of the verdict. But does that mean he can never change? 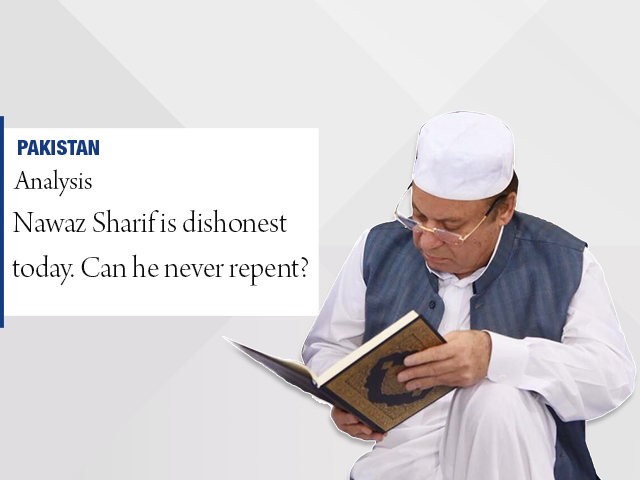 “If a person is not honest today, does that mean they can never repent?” Agenda 360 host Haider Waheed asked. Other than “sadiq” and “ameen”, Articles 62 and 63 require that public office contestants should not be extravagant. According to Waheed, extravagance and dishonesty are personality traits, which change over time.